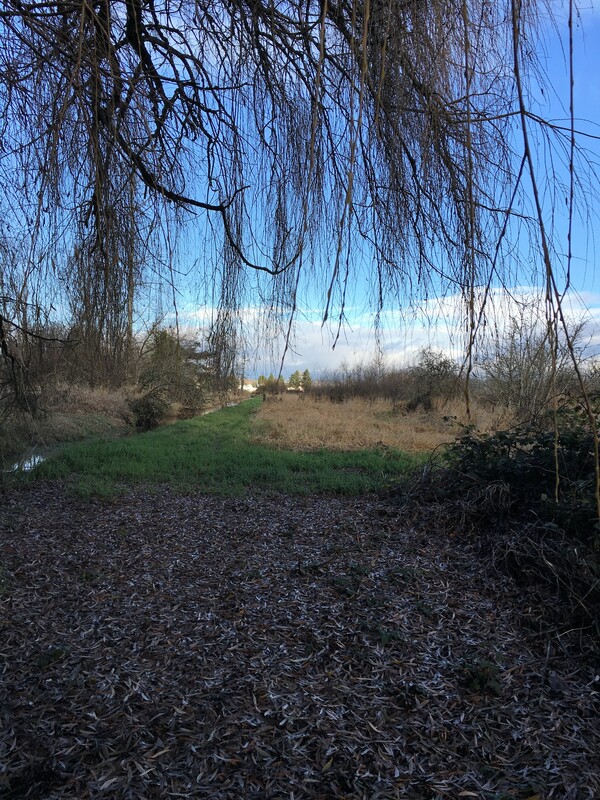 A large willow shades out reed canarygrass and other invasives on Nancy’s Ditch (near 44th). 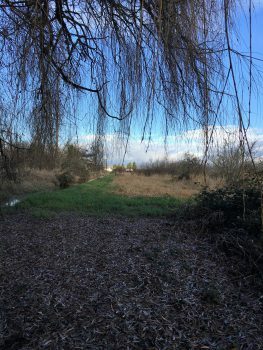 The Farming in the Floodplain Project, led by PCC Farmland Trust, has partnered with the Pierce Conservation District to explore possibilities for a large-scale planting project in the Clear Creek area. We are scoping out the feasibility of planting up to 6 acres of plants all along Nancy’s Ditch. The goal is to use native plants to shade out invasive plants (such as reed canarygrass and elodea) in the ditch. The reduction of ditch-clogging invasive plants will improve the flow of water throughout the ditch and improve drainage for agriculture, and also reduce longer-term maintenance needs. This project has garnered vocal support from many partners, including residential and agricultural landowners, Drainage District 10 Commissioners, folks representing habitat interests, as well as County staff from Pierce County’s agricultural program and Surface Water Management. We are hard at work exploring and planning this project, and our Landowner Engagement consultant will continue reaching out to area residents to describe the project and assess interest. Support for the project will come from a mix of County dollars, Farming in the Floodplain Project funds, and additional outside sources. We will share more information as we are able to! Please contact us if you have any questions. The Sediment Memo documents what information is known about sediment in the four tributaries of Clear Creek- Canyon, Clear, Swan, and Squally Creeks. It also summarizes what is known about sediment in the Puyallup River, based on a presentation by Kris Jaeger of USGS on November 2, 2016. The agricultural community in the area requested more information about sediment, in order to increase understanding of current and future sediment regimes, how sediment affects flooding and drainage, and how an earthen berm may impact sedimentation. This memo is based on several conversations with experts, published data, and a presentation and discussion from the 4th TAG meeting. Our next TAG meeting will be in early February. We will discuss conservation easements, the Flood Risk memo that ESA is currently drafting, and hear from Cynthia Krass, the Executive Director of the Snoqualmie Valley Watershed Improvement District, who will discuss the efforts of farmers in the valley to organize around drainage and water rights.